One of the most important tasks for in-service weld inspection of girth weld seams is the detection of planar defects and its sizing. The information about the shape, position and depth of defects like cracks and lack of fusions can be measured quantitatively with a mechanised system for a controlled geometry of the X-ray source and line camera. The basic problem of radiography as well as of the radiometric scan technique is the dependence of the measured crack contrast on the radiation direction in relation to the crack orientation. Only transmission along the crack plane provides sufficient contrast. This requires application of the multi-angle technique. The developed sysytem TomoCAR (Tomographic Computer Aided Radiometry) allows the modification of the radiation direction. It is possible to set up the system for a special inspection of sidewall flaws or radial flaws. Scanning the weld under different angles provides multi -angle projections that improve the probability of detection for planar inhomogeneities in the material like cracks and lack of fusion. Furthermore, the multi- angle technique provides enough information for a 3D-reconstruction of the weld structure. New methods of digital laminography and tomosynthesis permit the measurement of the shape and depth of the indications. The principle of the tomographic computer aided radiometry (TomoCAR) is represented in fig. 1. The X-ray tube and radiographic line camera are mounted on the pipe separated by an angle of 180°, so that a girth weld seam is scanned by a synchronous movement of the X-ray tube and radiographic line camera line by line. The scan results in a radiometric digital image, which is represented on the monitor (fig. 2) and may be printed onto film. Fig 1: Scheme of the mechanised X-ray inspection. Fig 2: Digital image of a scanned weld seam (diameter 140mm, wall thickness 13mm, image processing: edge enhancement). The first evaluation can be carried out on this radiometric image. For this purpose standard functions of the image processing, such as contrast, brightness, edge enhancement and zoom functions, can be used as supporting tools. With the result of the first evaluation it will be decided if further analysis methods must be used for the better evaluation of the indication. The applied principle of line scanning yields several advantages in comparison to the film radiography. The radiation direction corresponds to the central projection technique which always enables radial penetration. All radial flaws (like cracks) are detected with maximum contrast. The application of different radiation angles increases the probability of detection of planar defects and reduces the false call rate. Furthermore, the multi angle technique provides enough information for a 3D- reconstruction of the weld structure. The analysis manipulator is built up as a modular system, which can be adapted to the requirements of the examination task (fig. 3). Pipes can be tested with a diameter of 176 mm up to 500 mm with three interchangeable ring track systems. The manipulator is applicable for pipe to pipe or pipe to elbow combinations. The configuration and examining preparation of the manipulator can be carried out outside the control range on the basis of the tube geometry and the local conditions. The manipulator is set on the pipe for the examination and fastened with belts during the complete procedure. All further manipulations are carried out by a computer- aided control and data acquisition hardware. Fig 3: TomoCAR-System. The rotational movement of the line camera and X-ray tube around the pipe can be synchronously carried out with the motor 'phi' . Fig. a) shows the linear axis 'Y' which moves only the X-ray tube parallel to the pipe axis. Fig. 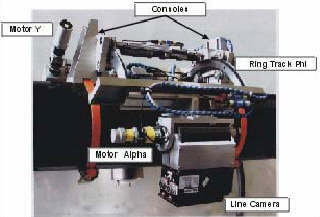 b) shows the line camera with the motor 'alpha' to adjust the line camera and X-ray tube. The X-ray line camera system consists of a CMOS-array and a slit collimator mounted in the front of the camera box, whose width is adjustable in a range of tenth of a millimeter. 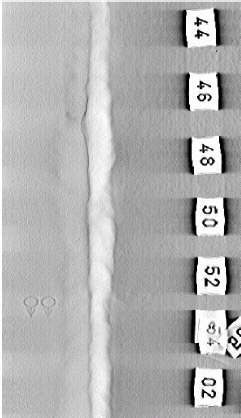 Investigations showed that a slit width of 0.5 mm leads already to a reduction of a scattered radiation of 95%. In the case of a CMOS-array a temperature control is not necessary. The pixel size amounts to 83 ľm at 1856 pixels per line. The contrast resolution is better than 2%, the spatial resolution amounts to 200...250 ľm. Planar inhomogeneities can be detect with a higher detection probability. Radiometric images are produced for penetrated steel thicknesses of 16...50 mm (8...25 mm of wall thickness). The complete examination time corresponds approximately to the time, which would be required for a manual examination with film. A new tube housing was developed for a commercially available mobile X-ray system, at which the tube window was designed for a special fan beam geometry. The target angle was changed. High-voltage cables were implemented with elbow plugs and a smaller cable diameter simultaneously. The basic problem of radiography and radiometric scan techniques is the dependence of the measured crack contrast on the radiation direction in relation to the crack position. Only penetration parallel along the crack plane (or to the largest planar plane) leads to a sufficient image contrast. The scanner developed at BAM allows the modification of the beam direction and therefore the detection of planar flaws that proceed in radial direction and along the circumference, respectively. The scans of the weld seam with different angles of incidence lead to multi-angle projections which improve the detection probability for the detection of flat inhomogeneities in the material. Among others it is possible to configure the system for a special examination of a lack of fusion. The principle of application is based on the multi-angle technique. 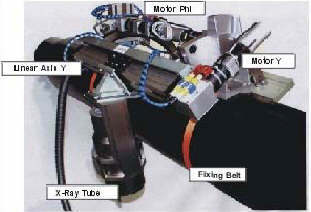 The X-ray tube is shifted along the pipe axis step by step. For each step a full 360° scan or only a predefined section of the pipe is taken as a 2-dimensional projection. In contrast to the X-ray tube the line camera is not shifted parallel to the pipe axis during the complete measuring procedure. This algorithm corresponds to the coplanar translational laminography, which was adapted to the requirements for the inspection of girth weld seams (fig. 4). If the X-ray tube is shifted parallel to the pipe axis and additionally, corresponding to fig. 4, each step is combined with an angular shift (pre-scan and post-scan), the principle of the coplanar rotational laminography can be applied . Due to this analogy between the configuration of the multi angle-technique and laminography the 3-dimensional reconstruction of the weld seam is possible. Either all measured radiometric scans can be evaluated or (and) the weld seam can be inspected plane by plane from the reconstructed 3D-data set. Fig 5: 3D-Surface of a crack. For applications of higher accuracy the principle of planar tomography can be applied. For this purpose the X-ray tube is shifted continuously parallel to the pipe axis only depending on the pipe diameter in a radiation angle range of up to ą 45°. Fig 6: Principle of the planar tomography. During the movement of the X-ray tube up to 400 one-dimensional projections are acquired. Therefore, each single scan represents a defined angle of incidence of the X-ray beam in relation to the line camera. The line camera is not shifted for each set of projections (fig. 6). The result is a cross section of the weld as a two-dimensional image, in which the indications can be evaluated with regard to shape and depth (fig. 7a). Planar tomography provides undistorted reconstruction results for cracks and lack of fusion if the defect plane is oriented inside the inspection angle range. Artefacts arise for volumetric indications, only due to the missing projection angle problem. The used reconstruction method is based on a modified filtered back projection. The measurement time (corresponds to the exposure time of the film) depends on the integration time per one scan and amounts up to 6 minutes depending on the wall thickness (8...20 mm). The reconstruction time is about one minute on a PC. This measuring algorithm is a typical analysis method and is used mainly for the cross section reconstruction in a predefined analysis range (ROI). The indication can be measured from the reconstructed cross sections of the pipe wall (fig. 7a). The evaluation of indications for open cracks and undercuts may be distorted by artefacts. The exact knowledge of the surface allows the exact determination of the distance between outer wall and crack tip. The knowledge about the inner wall profile enables furthermore the measurement of the wall thickness profile . Surface indicators were developed to obtain the missing information about the surface in the reconstructed images. The surface indicators consist of wires (e.g. copper - brackets), which are situated to defined equidistant positions on the surface, lateral to the weld (fig.7a, white marks). Fig 7a: Reconstruction of the planar indications and determination of the coordinates of the outer surfaces by means of indicators. In a second step the wall thickness and the inner surface contour is reconstructed with the same projection data set. For that purpose the information about the outer surface is used as priori-knowledge for the reconstruction, which is based on the Baysian method. The result is a calculated binary image, in which the wall thickness can be measured and the inner and outer surface contour is calculated (fig. 7b). Fig 7b: Reconstruction of the wall thickness and continuous shape of the surfaces as binary image. The third step contains the superimposing (data fusion) of both reconstruction results (fig. 7c). Non-relevant information can be removed. The shape and the depth of the indication can be measured in relation to the wall thickness. Fig 7c: Data Fusion - Superposition of the reconstruction results and evaluation of the shape, position and depth of indications. The developed equipment for the mechanised weld inspection by tomographic computer aided radiometry TomoCAR represents an alternative to the classical manual film radiography for the in-service inspection. It yields quantitative radiographic data, which are comparable to results of the computed tomography. The sensitivity has been improved for volumetric and planar defects. The planar tomography as an analysis procedure is a fast and suitable method for the reconstruction of the pipe wall cross section and inner inhomogeneities. The extraction of information about the position, shape and depth of the indication contributes to a reliable and quantitative characterisation of planar indications (e.g. cracks, undercuts and lack of fusion). The quantitative analysis of planar defects was improved by the combination of different reconstruction methods. Therefore, an algorithm was applied on the basis of a modified filtered backprojection [2,3] combined with a new iterative algorithm for the surface reconstruction through the measurement of the surface location as analysis of the directional beam absorption. The measurement time for a complete girth weld seam of a pipe with a diameter of 300mm and a penetrated wall thickness of 25mm amounts to approx. 50min. The measurement time and reconstruction of a pipe wall cross section image (planar tomography) at the same tube amounts to approx. 7 min.